Ariel Sharon was a serial mass murderer, engaged in massacres of unarmed victims in four countries, of all ages and conditions. He was a “hero” for hundreds of thousands of Israeli Jews who settled on land and in houses seized from Palestinians in the West Bank. He was praised by Western leaders at his funeral for his violent, lifelong opposition to Arab nationalist movements throughout the Middle East. That he was a fanatical upholder of Jewish supremacist policies and practices did not go unnoticed by wealthy Zionist donors in the US. During his tenure as a senior official in numerous Israeli regimes, they contributed hundreds of millions of dollars for Greater Israel and extracted nearly a $100 billion more from the US Treasury. Israeli leaders praise of Sharon as a valiant, brilliant and legendary military leader is echoed in the US mass media and repeated by most Western leaders. He was, in the view of his US adulators, a powerful leader who defied world public opinion in his defense of Israel, who seized Palestinian and Syrian territory and who was willing to strike an independent policy even against Israel’s main benefactors in Europe and North America. This essay does not simply recount Sharon’s lifelong criminal record. The story we will relate has more to do with (1)the crimes that continue to live after him; (2) the political and military context which allowed him to butcher non-Jewish populations with impunity; (3)the psychological core of Sharonist impudence and arrogance which is so deeply etched in the political psyche of all of Israel’s contemporary leaders. Sharon’s record as a serial genocider is beyond dispute. As early as the ‘founding years’ of Israel in 1947 – 1948 Sharon was commander of the murderous Alexandroni and then the Golani Brigade which murdered, uprooted and terrorized thousands of lifelong Palestinian residents. He later was the commander of Unit 101, an Orwellian Death Squad, which reduced villages to rubble, blowing up homes, where mostly women and children were hiding. In October 1953, Sharon assaulted the Jordanian village of Qibya blowing up forty-five houses and killing sixty-nine civilians, the vast majority women and children. In the early 1950’s Sharon ruled over Palestinian settlements with an iron fist, murdering dissidents, arresting and torturing protestors on a mass scale. On October 29, 1956 Israeli, British and French troops invaded Egypt to seize the Suez Canal and recolonize the country. Colonel Sharon led the 202th Paratroop Brigade which seized the Mitla Pass and covered himself with gore – murdering all the Egyptian military and civilian prisoners. The Israeli military advance was stopped cold despite its military alliance and supply from Britain and France. President Eisenhower told the Israelis and their French and English allies to end their aggression and proceeded to cut off all military and economic aid to Israel; shut off IMF funding for England and France’s post WW II bankrupt economies. US Zionists using their leverage in the Democratic party especially over Lyndon Johnson, House Minority Leader, to block Eisenhower’s economic sanctions and to support Israel’s invasion. Eisenhower rejected Zionist pressure and went to the UN Security Council where his armistice and withdrawal proposal was vetoed by France and Britain. Eisenhower then called a special session of the General Assembly where he triumphed by a 12 to 1 margin. France, Britain and Israel were defeated and forced to retreat. No other President before or since Eisenhower ever took a forthright stand against Israeli colonial wars and territorial seizures. During the so-called Six Day War (June 5 -10, 1967), Israel’s sneak attack on Jordan, Syria and Egypt, resulted in the seizure and occupation of vast areas and the conquest of millions of Palestinians. Sharon’s military achievements included the wholesale massacre of Egyptian prisoners of war.. President Lyndon Johnson, totally under the thumb of his Zionist fundraisers, not only supported Israel’s war of aggression but acquiesced in Israel’s bombing of the US intelligence ship the Liberty and the killing and maiming of over 200 US sailors. In the 1973 Yom Kipper War, Sharon and the Israeli high command were on the verge of military defeat by the Egyptian and Syrian armed forced intent on liberating occupied territories, until Kissinger airlifted 22,395 tons of weapons to Israel, including scores of fighter planes, helicopters and transport planes to turn the tide. Sharon’s political career was aided by his leading role in massacring Palestinians in Lebanon and in the Occupied Territories. 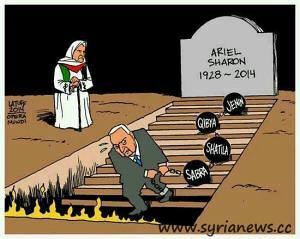 In Lebanon, Sharon slaughtered 2000 children and women at the Sabra and Shatila refugee camp. He certainly did not rise to political power for his mediocre performance during the Suez crises and Yon Kippur war. In fact, when Sharon faced well-trained and well-armed military forces, as was the case during the Hezbollah war in 2006, he was even less than a mediocre commander. Only against civilians and poorly trained irregulars did he “succeed”. Only where he could murder and dispossess hundreds of thousands of unarmed civilians and settle Israeli Jews was he glorified as the “King of the Jews” by the Israeli settler population. Israel cannot and does not wield power on the bases of its military capability or performance – it operates on borrowed power. When the US was ruled by a President who rejected Zionist influenced Congressional pressure and used available economic and political leverage, Israel retreated, surrendered captured territory and abided by UN sanctions. In other words, Israel’s war aims and its bellicose behavior, is dependent on the power of the Zionist power configuration in the US to turn Washington in its favor. Sharon is, in a sense, a “cardboard general” who has lost or nearly lost the most important battles in his career – beginning with Suez in 1956, Yom Kippur in 1973 and Lebanon in 2006. Israel has prospered economically and become a major military power largely through over $130 billion dollar transfers from the US Treasury over the past half century; plus tens of billions in favorable trade concessions; plus ‘imports’ of highly trained professionals from the US and Russia (educated by the tax payers of those countries); and more recently billions more in “venture capital” by overseas speculators. In other words, Israel is an artifact of the ‘power of extraction and transfer’ by its overseas acolytes embedded in the US political and economic power structure. It was one thing to joke, as many of us did in our university days, about the ghetto expression “Is it good for Jews?. It is another for leaders in positions of power to apply this ethnocentric criteria to American foreign policy, personnel recruitment and professional appointments. That is the real legacy of Ariel Sharon: the legacy of an Israel -centered world built on ideology of ethno-religious supremacy which displays superiority and disdain for non-Jews. For the ethnic supremacists like Sharon, most Americans exist to pay tribute and fight wars for Israel and to keep a tight lip about it. Let it be said, here and now, that Sharon’s presumption to speak for “the Jewish people” confused his rabid electoral supporters in Israel and blind adherents among US Zionist leaders, with a growing number of Jews and ex-Jews who detested him and scorn his legacy. His boast that “Jews control America” has dangerous implications, especially in the context of growing popular malaise in these United States. Sharon’s claim that Americans knowingly submit to a foreign tyranny, is very provocative especially if and when Americans begin to wake up--- and it will be the majority of Jews, who neither abide by Sharon’s legacy nor share his naked contempt for non-Jews, who will pay a painful price.